You must be a member of the Brussels Badminton Group to attend this activity. Would you like to join this group? 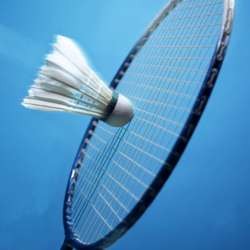 Let's meet for some fun and exercise on the badminton courts from 7 to 9 pm. Four courts are reserved (limitation from the Sport Center ) which theoretically means that max 16 participants can take part to the event. However, statistically players don't play 2 hours in a row without interruption, so we accept 3 additional players to fill the breaks. The maximum number of participants is therefore 19, following the first come first served concept. 4. Two no show-ups (not necessarily in a row) will put the participant on a black list, meaning that he/she will only be entitled to play the next time after transfer of a €18 deposit (€12 for the 2 no-show-ups + €6 deposit prior to the event). 9. In principle, maximum 2 games in a row (first match and „revanche“) should be played in the same format (the same 4 players, irrespective of „internal“ changing of a partner in a pair), in order to maximize the possibility for each player to play with other players of the group during the event. Rackets can be rent at the reception of the Sport Center against a small charge. Last but not least, we sometimes go for a drink/dinner after the event. This is obviously not compulsory but help to create a positive atmosphere among the group.